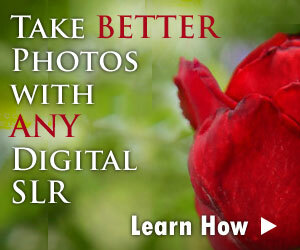 If you've read anything about digital SLR cameras, I'm sure you've heard someone harping about digital SLR sensor dust. The destroyer of all photos! The end of your camera! While I agree that digital SLR sensor dust is an issue, I'm not sure that I would go to the extremes that some others do. Before I talk about solutions to the digital SLR sensor dust problem, let's identify just what the problem really is. Here it is in a nutshell: you can take the lens off of your digital SLR camera. Since you can remove the lens, you can also expose the digital sensor to the elements. This is why dust is a non-issue for compact digital cameras: since the lens is fixed in place, the sensor is never exposed to open air. No exposure, no dust. When a dust particle finds its way onto your digital SLR sensor, it shows up in every photo that you take as a small round smudge. Before you start thinking that one particle of dust can ruin every photo you take with a digital SLR, let's put things into perspective. Take a look at the image to the right. Can you see the dust speck? Now click on the image to see an enlarged view that really shows off that nasty little dust mote. There you have it: that's the result of getting dust on your digital SLR sensor. If you don't find that very offensive, then don't worry about getting small particles of dust on the sensor. This is the only effect they will have on your photos. However, if you tend to take photos in dusty conditions (i.e. the desert) and also enjoy changing lenses a lot, then you are creating a situation where you can get a ton of dust on your sensor which will impact the quality of your photos. There are two easy ways to control the amount of dust that you get on your digital SLR sensor. The first solution is possible if you purchase a mega-zoom lens that goes all the way from wide angle to telephoto. The primary drawback to this solution is that you are eliminating one of the major advantages of owning a digital SLR: the ability to change lenses. Since this solution is not ideal, I recommend the second to avoid digital SLR sensor dust. While this approach may border on the obsessive compulsive, it has kept my sensors clean for the past 5 years and I change lenses a LOT. This approach to changing lenses ensures that the digital sensor is exposed for a limited period of time, greatly reducing the opportunity for it to collect dust. If neither one of those solutions sound all that great to you, there is a third option: buy a digital SLR with a dust control system. Cameras with dust control systems use a variety of mechanisms to repel dust from the sensor (with electromagnetic fields) and to automatically clean the sensor every time you turn the camera on (by vibrating the sensor to "shake off" particles of dust). Once quite rare on digital SLRs, the first dust control system was originally introduced by Olympus on their line of EVOLT digital SLR cameras. Today they are a common feature of every new camera released, regardless of brand. While the effectiveness of a dust control system is not an easy thing to test (unless you want to contaminate the insides of your expensive camera) it's safe to say that if you're careful about how you change lenses (see above) and don't expose the sensor for prolonged periods of time then a dust control system will ensure that your images remain dust-free for a long time. If you are noticing little black smudges in all of your photos, then you've got a dust problem. The first option is definitely the more expensive of the two, but also the safest. When a trained technician cleans your camera, you can be sure that the sensor will come to no harm while it's being cleaned. The second option is for those willing to take on a little risk in order to save some cash. There are a variety of ways to clean a sensor, from blasting it with air to sweeping it with an electrostatic brush. The most efficient and effective method to remove all types of dirt and gunk from your camera's sensor is to use a specially treated sensor swab. Two companies that produce sensor swabs and liquid cleaning systems are Photographic Solutions and Visible Dust. The risk associated with cleaning the sensor yourself (using any mechanism) is not trivial: you can permanently scratch or otherwise damage your camera's sensor, resulting in a prolonged trip to the repair shop. Having said that, sensor cleaning has become quite mainstream and the products available today are tested to ensure that they won't damage your sensor or leave it dirtier than before you cleaned it. So long as you follow the step-by-step instructions provided with the cleaning product and are delicate about wiping the sensor clean you should be able to eliminate any dust particles yourself without having to pay a service technician to do it.